A little recap on 2018. Learn about the time I got stuck on I-80 and what it taught me about living life. To kick off the beginning of December, I spent almost of week of it in a mall. Granted, that mall was connected to a hotel and a hotel convention center for a conference I was attending, but I did spend a lot of time with recycled mall air and the sounds of people shopping for holiday gifts. I was attending ARL’s Library Assessment Conference down in Houston, TX. A big reason for my attendance was to co-present on a participatory design project I helped with at Penn State (and was a parallel design project with our collaborators at Montana State). I co-presented with Scott Young and it was a great opportunity to talk about our work with Native American and first-generation students at our institutions. Penn State operates under the motto, “One campus, geographically dispersed.” Before I moved to Pennsylvania, my knowledge of state systems came from growing up in Wisconsin, under their UW system. UW Madison is the mothership, and while students might move between the various campuses, each campus operates on its own. Each campus has a library, with its own dean, librarians, staff, etc. Once I started at Penn State, I adjusted to the idea that we have one Libraries Dean, and many of my colleagues aren’t in the same location as me. Thank goodness for technology like Zoom, so while we would prefer face-to-face, we still can have a way to communicate and share ideas. Part of my job description as the Student Engagement & Outreach Librarian is to help create a framework, vision, and approach to student engagement within the Libraries. This means I have the opportunity to work with my colleagues throughout the library, on many different campuses. It feels like a daunting task at times but it is also one of my favorite parts of my job. The end of May marked a year since I was standing up in front of my colleagues, stating my intentions of being the Student Engagement & Outreach Librarian. The exact one-year mark from my in-person interview, May 24, was a day filled with student engagement conversations, which seemed fitting for that particular anniversary. And soon, July 1, will mark a year of me being in this role. In the past year, I’ve thought a lot about student engagement. 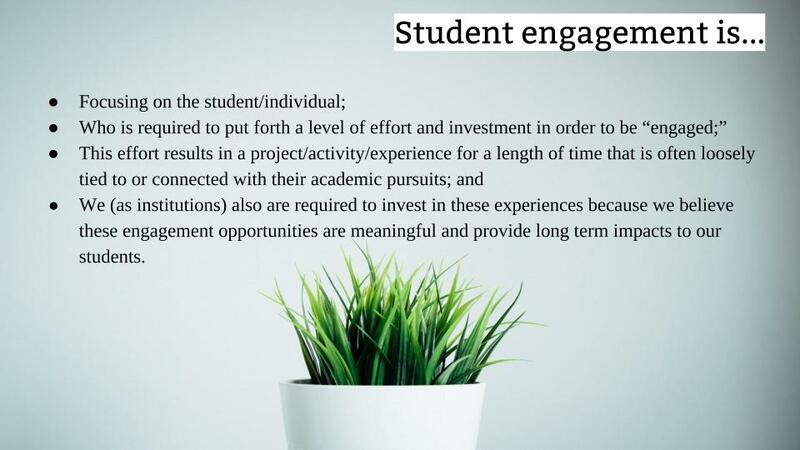 In many ways, how I feel and define student engagement hasn’t changed, but I’ve gotten better at explaining and articulating that definition to my colleagues and to stakeholders outside the library. Student engagement continues to be a phrase that is slippery, like soap. Just when you think you have it, it jumps out of your hands. Different stakeholders have different ideas of what these two words mean. There’s still a long way to go to get everyone on the same page but I’m pleased with the work I’ve done in the past year to make some headway. Tell us how you would go about approaching the Libraries' role and leadership capacity in this environment. In particular, tell us about how you build a scalable program of engaged scholarship at a large, multi-campus university library, including strategies for relationship building, identifying campus partners, and sustainability. In this presentation, they were asking me to speak on engaged scholarship (a subsection of opportunities around student engagement). I definitely focused on those elements, but also included student engagement, broadly. A slide from my talk, broadly defining engaged scholarship and student engagement. As I prepared for the presentation, I knew in my gut what student engagement was. I knew because I had experienced it myself as an undergraduate at Coe. At points leading up to May 24, I debated using this slide of me throughout undergrad since it called out my youngness (2014 wasn’t that far from 2017). But I wanted to use it because my whole perspective about student engagement is around these experiences. When I try to define student engagement to others, I call on my internships in New York City, my transformation while I was hiking around the Lake District, reading to elementary students in Cedar Rapids, and the leadership skills I gained as the Student Senate Treasurer. You cannot divorce my definition and opinions on student engagement from those personal experiences. For me, I see that as a strength because I know in my gut what it student engagement is and it allows me to speak confidently on the topic, drawing from the ways in which student engagement impacted me. For me, student engagement looks like this. Once I started in the role of Student Engagement Librarian, I had to go about defining this word, more than just always throwing up a slide of me doing a bunch of stuff in undergrad (although that would be awesome). Lucky for me, I have a good boss who encouraged me to write a scope statement (because scope creep is real, especially when you’re changing jobs within an institution) and also gave me four hours to lead a meeting on student engagement with my department early on in my position. During the scope statement writing process, I read a lot of articles on student engagement. Naturally those articles intersect and intertwine with folks like Astin and Tinto (both who focused on student development and retention in undergraduates), and Kuh (THE guy on student engagement assessment in higher education) as well as new scholars (to me) who talked beyond behavioral aspects and dove into how student engagement impacts our student holistically. While there were different strands, I could begin to see how to articulate a more shared definition. My favorite article during my scope writing days was one from Johanna Vuori who asked in her title, “Student Engagement: Buzzword or Fuzzword?” Student engagement is truly a fuzzword. Part of that fuzziness, comes from the words “student” and “engagement.” Often I’ll hear people talk about how a student is engaging with the library (through participation) or how a particular instruction activity really engages the students. While that’s true, it doesn’t mean it’s student engagement. It’s engaging students, but is missing some of the core elements of the word. The other part of student engagement, especially in a library sense, is that it gets tangled with outreach. At the end of the day, student engagement and outreach are two, distinct, things, but we need both in our day-to-day. Good outreach can lead to student engagement. You need both, but both provide different things to our students. The past year I've really worked to untangle these threads, have lots of conversation with folks to hear how they are thinking about these topics, and start to make something cohesive. My job is help move the library towards an aligned approach to student engagement, across the Commonwealth. As I've been asked to speak and present on my job, I've come up with good ways to explain what I do and my framework. You're probably waiting for me to define student engagement so here it is. For me student engagement is about the student, who investing time and energy outside the classroom setting to be "engaged." This engagement can be tied to a student's academic pursuits, but doesn't have to be. Finally, this student is working on a project/activity/experience for a significant length of time (it's not a one day thing). Along with the student being engaged, we, as institutions of higher education, also have a responsibility to support these experiences and make sure they are meaningful for our students. Recently, this definition of student engagement has expanded into a more focused definition on how student engagement and the library work together. For that focused definition, I have Tim Schlak to thank. He wrote an article in The Journal of Academic Librarianship this year (2018) that was really helpful for me. It's called "Academic Libraries & Engagement: A Critical Contextualization of the Library Discourse on Engagement" and in the abstract he puts forth that libraries don't have a good grasp on a common definition of student engagement and that, in turn, makes it hard for us to use that phrase in a way that resonates with the higher education community. Based on this article, I now not only talk about the broad definition of student engagement, but also how it fits within the library context. With this frame, we see the library as providing some of those valuable resources and spaces for students in student engagement experiences, we see ourselves as experts in teaching and learning, and we seek to move beyond traditional, transactional roles with students to find ways to create student engagement opportunities where the library plays a more prominent role. To me, that's exciting and where I want to focus my time and energy. My newest slide in my student engagement talks, thinking about the library focus on student engagement. Now, these slides are really helpful when talking with colleagues and stakeholders. This really helps us get on the same page and start thinking about how we might provide, support, sustain, and create these opportunities. However, these aren't the slides I use when working directly with students and student groups. Instead, I've found that emphasizing my role and relationship to them really resonates and works to build trust and collaboration. 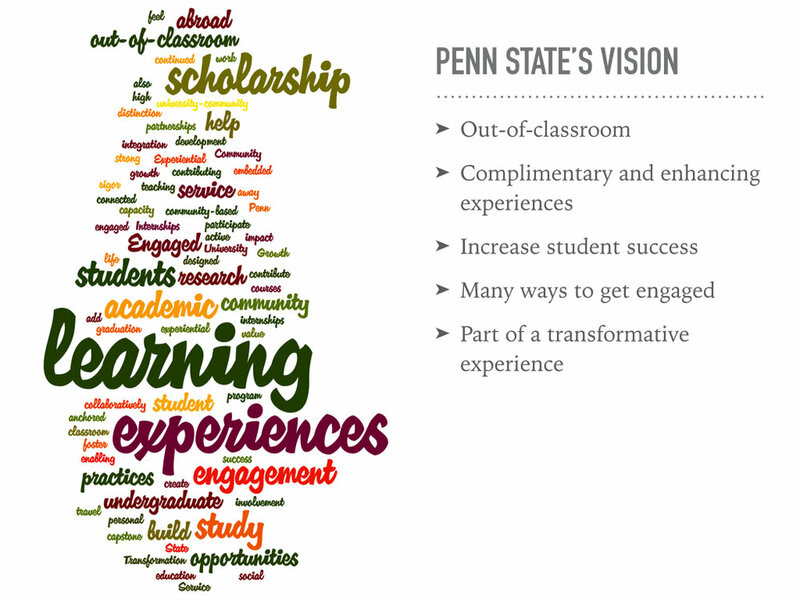 As much as I am trying to create opportunities (or make current experiences better), the only way I can do that is if I have a good understanding of what students are experiencing at Penn State and what opportunities outside the classroom look like for them. Once I know and understand, then I'm in a better position to leverage and amplify those experiences in conversations, committees, working groups, and ultimately, decision making. For my first year in the job, I'm feeling good about where I am. I think I've made some important strides, met some great people, and had a lot of good conversations about what student engagement means, looks like, and can be. I know my work is definitely not done and I look forward to where I'll be headed next. 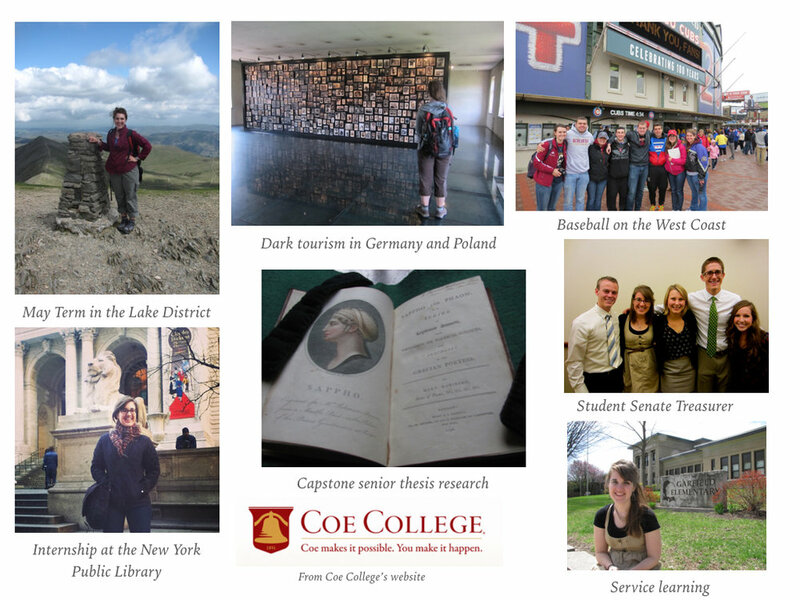 This summer I'm excited to get on the road and meet with my campus colleagues. I've created a workshop that I'm pretty proud of and I'm looking forward to having conversations about student engagement and then making some goals we can strive for. I continue to see my role as the Student Engagement & Outreach Librarian as a unique position where I not only have a chance to help provide and support student engagement experiences, but as a member of the faculty with an eye to research, I can also share these experiences through scholarship (and my dream is to publish with students). I'm going to wrap up this post with a couple of tweets from a recent #critlib chat. It was around engagement/outreach/advocacy hosted by Kelly, Hale, and Amy. It was nice to chat with folks who are engaged in similiar work and it also gave me an opportunity to define those three words in three tweets. A full recap of this great chat can be found on Wakelet. Things don’t always go as you planned. For example, you get moved into a cubicle, the conference proposal you submitted didn’t get accepted, you bike to work and then Mother Nature decides to rain, a first date goes better than you expected, you end up having a complicated relationship with Mother’s Day, or the TV show you love gets canceled (only to be picked up by another network). Change happens, no matter if you’re ready for it or not.